The Michigan State Department of Corrections requires both male and female correctional officers at the local and state levels. Applicants with a strong sense of justice, empathy, and integrity as well as a thirst for on-the-job training will find a lucrative and rewarding career in any of the state's 37 state facilities as well as in the county jail system. Currently, there are 11,251 front line correctional officers working with 43,704 incarcerated offenders; due to the demands of the role and changing needs of the corrections system across the country, the industry is poised to grow by a steady 5% until 2022. This statistic furnished by the Bureau of Labor Statistics indicates that the state of Michigan will be ramping up recruitment efforts in order to meet the forecasted demand of over 550 new roles. In addition to this trending increase, the state will have other vacant roles due to staff retirement, attrition, and career advancements. Interested in reading more about lucrative and challenging careers in corrections industry? Read on for more information. Lake Superior State University ranks 1st in our latest rankings with ninety-two students completing programs in corrections and criminalistics and criminal science out of a total a thousand students. Olivet College ranks second in our latest rankings with thirty-four students completing programs in criminal justice out of a total 480 graduates in the 2012-2013 school year. Ferris State University ranks 3rd in our latest rankings with 452 students completing programs in criminal justice, law enforcement administration, and criminalistics and criminal science out of a total seven thousand students in the 2012-2013 school year. Madonna University ranks fourth in our rankings with 148 students completing programs in criminal justice out of a total three thousand students in the 2012-2013 school year. Siena Heights University ranks fifth in our latest rankings with 91 students graduating from programs in corrections and criminal justice out of a total a thousand graduates. Finlandia University ranks 6th in our rankings with eleven students completing programs in criminal justice and corrections out of a total 254 students. West Shore Community College ranks 7th in our rankings with 18 students graduating from programs in corrections and criminal justice out of a total 418 students in the 2012-2013 school year. Adrian College ranks eighth in our rankings with 22 students graduating from programs in criminal justice, corrections administration, and law enforcement administration out of a total 576 students in the 2012-2013 school year. Northern Michigan University ranks 9th in our rankings with 127 students graduating from programs in criminal justice, security and loss prevention services, and law enforcement administration out of a total 3,728 students. Alpena Community College ranks 10th in our latest rankings with twenty-six students graduating from programs in law enforcement administration and corrections out of a total 764 graduates in the 2012-2013 school year. Founded in 1961, Delta College is located in University Center, Michigan. Enrollment hovers around 15,000 students at this public, 2-year college; students choose from a range of certification and degree programs. Among the programs offered are Delta's rigorous corrections and juvenile corrections programs. Students looking to qualify for the corrections recruitment processed are encouraged to contact Delta's Criminal Justice Corrections faculty for more information. Schoolcraft College ranks thirteenth in our rankings with 127 students graduating from programs in criminal justice out of a total four thousand graduates. Since 1914, Grand Rapids Community College has been a fixture in the city of Grand Rapids, Michigan. With a student body of over 15,000, the college offers a variety of certificate and degree programming to meet the needs of today's students. GRCC has a comprehensive Criminal Justice Department; students pursuing a career in corrections would do well to contact the department directly for information regarding course options and career paths leading to correctional officer status. With 13,000 students, Henry Ford College is a notable institution in the city of Dearborn, Michigan. A public 2-year college, HFC offers a variety of certification and associate's degrees to prepare students for further educational opportunities or for entry into the career of their choice. Students interested in pursuing a career as a correctional officer should note that HFC's corrections program can be used either to entry the recruitment process directly or to pursue further education in the criminal justice field. St Clair County Community College ranks 16th in our rankings with 37 students completing programs in criminal justice out of a total a thousand graduates from the 2012-2013 school year. Saginaw Valley State University ranks 17th in our latest rankings with 96 students completing programs in criminal justice out of a total three thousand graduates in the 2012-2013 school year. Bay de Noc Community College ranks 18th in our rankings with twenty-four students completing programs in criminal justice, corrections, and criminal justice out of a total 980 graduates in the 2012-2013 school year. Bay Mills Community College ranks 19th in our rankings with two students graduating from programs in corrections out of a total eighty-six graduates. 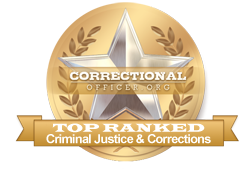 North Central Michigan College ranks 20th in our latest rankings with 15 students completing programs in corrections, criminal justice, and law enforcement administration out of a total 698 students. Candidates who have passed the assessments may be offered conditional employment based on a satisfactory training experience. Basic training entails teaching new hires a variety of practical skills, policies and procedures, as well as improving personal fitness goals in order to be well-prepared for their new job. Only candidates who pass basic training will be considered ready for a position. Michigan's State Department of Justice is committed to ensuring growth and development for the state's correctional officers. Median income for this role throughout the state is $53,700 compared to the national median income level of $39,800. According to the employment profile for the state, published by CareerInfoNet.org at http://www.careerinfonet.org/occ_rep.asp?next=occ_rep&Level=&optstatus=011000000&jobfam=33&id=1&nodeid=2&soccode=333012&menuMode=&stfips=26&x=0&y=0 state and national trends predict a 5% increase in correctional jobs by the year 2022. In the state of Michigan, this nets a positive growth curve in from year to year, both in newly created vacancies and in vacancies from senior officers who advance or retire. The table below lists career information collected by the Bureau of Labor Statistics for correctional officers in Michigan. The table is sorted by total employment, with the largest metropolitan areas listed first.